Sci-fi movies can rarely be made in such way that can be looked at as works of art. This is one of the few exceptions. The prediction of judgment day with Hamilton watching a playground full of kids be burnt to the ground is an absolute brilliant portrayal of Armageddon. The theme that men will destroy themselves is also shown throughout the movie also and is even said by The Terminator…“It’s in your nature to destroy yourselves”. This brings the movie to a whole new level of sci-fi and one of the most sought after of titles by collectors of the genre and Schwarzenegger’s vast legion of fans. 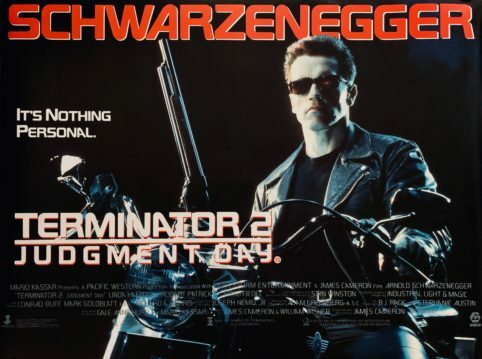 Offered here is an original 1991 British UK quad film poster for James Cameron’s sci-fi, time travel, shoot ’em up uber-actioner “Terminator 2: Judgement Day”. The horizontal landscape format of the British quad perfectly complements the design by The Cimarron Group with iconic imagery that has become as recognisable as Arnie himself. One of the most influential film of the past 25+ years with ground breaking CGI special effects and spectacular action set pieces. 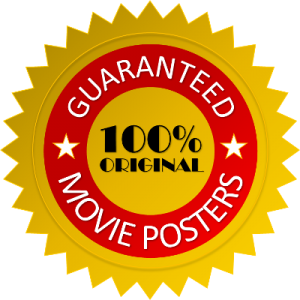 A very hard film poster to find in this excellent unrestored rolled (as issued) condition that represents an impressive item of original cinematic movie memorabilia. Trivia: This is the only “Terminator” film to win or be nominated for an Oscar and won four out of the six it was nominated for.